If your child is artistic and loves creating, as well as being a technology whizz, we’re sure that a 3D pen is on their wishlist. These little devices have become quite popular among adults and kids alike. Many 3D pens are a great family tool, allowing parents and kids to come together in a fun and creative way. However, some pens are not at all suitable for kids. 3D pens heat plastic to work, and anything dealing with heat and melted plastic can become a hazard for very young children. 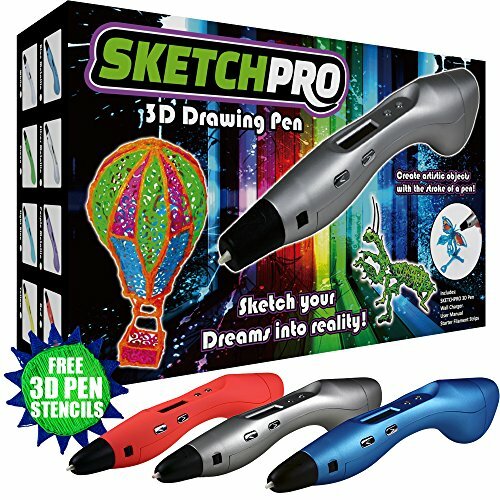 Thankfully, there are many brands of 3D pens that have been designed with kids in mind and have built-in safety features to keep your mind at ease as your little ones enjoy creating their designs. Find some of the best pens on Amazon in this guide below. 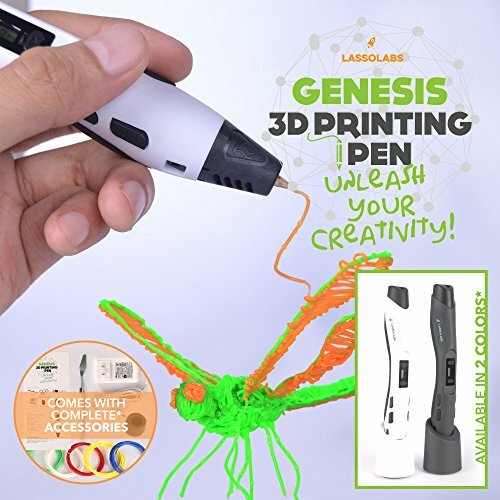 With so many 3D pens to choose from, it can be hard to pick out the best 3D pen on the market. When we had a look at 3D pens specifically for kids, we found the BESTTHING pen, and true to its name, it really does seem like the best thing for kids. 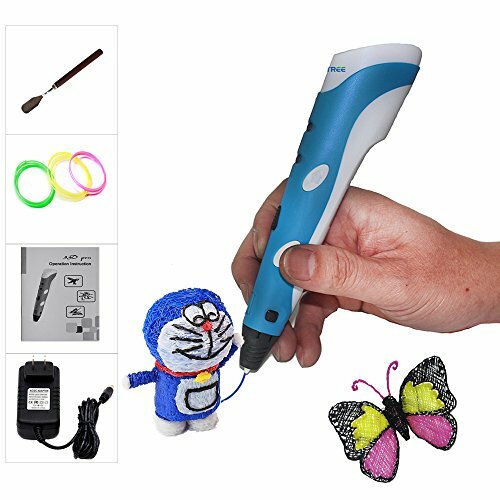 Its safety features and ergonomic design are great for little ones learning to use 3D pens. We looked at reviews and ratings from other parents whose children were using these 3D printing pens. Of all the ratings, the Tecboss 3D printing pen came out on top. It has a professional look and feel, yet is still simple enough for beginners and kids. 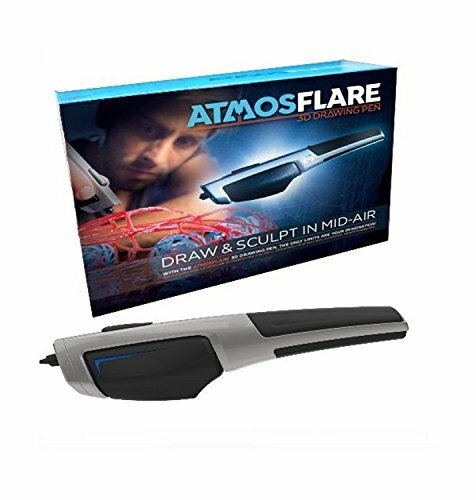 Whether you’re looking for a handheld 3D printing pen that your child can use on their own, or you’d like to help them but don’t have much experience yourself, the Atmosflare 3D printing pen is perfect. With its simple design and easy-to-use features, getting started with this pen will seem like a breeze. It also uses cool ink, making it less likely to burn finger that may get in the way. Almost all 3D pens will seem like magic when you first hand them to a child. Watch as their face lights up the first time they create a 3D model. The most magical 3D doodling pen, though, must be the 3Doodler. With its amazing features and brilliant design, it is sure to bring hours of magical fun for your little one. If running on a budget, or you’re just not quite sure how long your child’s interest in a 3D printing pen will last, you may want to have a look at cheaper options. Our favourite low-priced pen is the Kuman 3D pen. It is still made with excellent quality, and it comes at a fantastic price with all the features you need to start 3D drawing. The BESTHING 3D Pen is designed for children in mind. 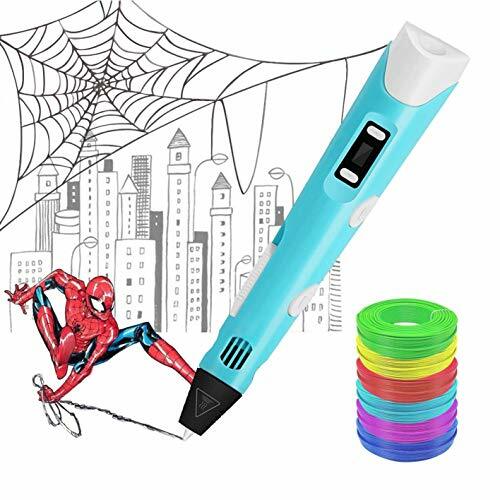 It is really the best 3D pen for kids. The streamlined design and fun colour allow your children to explore their creative side, while also developing their spacial awareness and design skills. The pen also works just as well for adults and professionals. The 3D pen has added safety for kids as it has a built-in heat dissipation port. This port adds a safety element as it heats up the filament very quickly, but then also cools it very quickly, which stops any scalding. The bundle includes the 3D pen, 6 packs of non-toxic PLA filament, and two stencils. All of this allows you to start drawing immediately. This bundle is a perfect gift for adults and children alike. 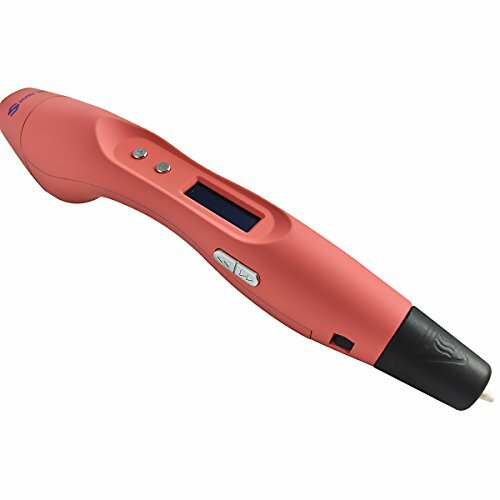 The Tecboss 3D Pen is one of the more professional models on our list. The model can support both PLA and ABS filament types, giving you the freedom to choose whichever material you need for the job. The pen offers users superior control, with 8 different speed settings, giving you the ability to make large, or very detailed pieces of art. It also has temperature controls, which control the extruding speed and makes the pen much safer to use for children. There is an OLED display that will not only show which material you are using at the time but will also show you the temperature. With the pen, comes with two finger protectors, to protect your thumb and index finger against burns and scalding. Looking at this 3D pen cost, the features will surprise you. Not only is this one of the lowest priced pens on our list, but it also boasts all the top features that are offered in the more expensive pens. 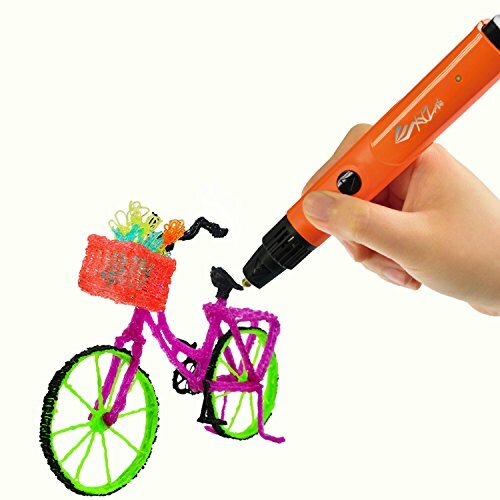 With the Kuman 3D pen, you get an ergonomic design, perfect for kids. You also get an OLED display which shows you the temperature, speed and the filament you are using. This means you can complete control over using the pen. The pen has a 30-second fast boot, so kids won’t get bored while waiting for the pen to heat up and be ready to be used. It will also auto-shut-off if left alone for five minutes. There is an easy switch button to switch filaments and an anti-clogging mechanism to avoid those pesky filament-jamming incidents. Retailing for less than $30, this is a great pen to start off with. It is designed as a fun way for kids to make 3D designs, and comes in three different colours, too. The pen supports both ABS and PLA filament, so you are not limited when looking to purchase refills. The kit includes the pen, a holder for the pen, an AC adapter and cord, 3 filaments of different colours, and 5 3D stencils to get the creative juices flowing. The pen itself is light and slim, weighing just 45 grams, which means kiddies hands will have no trouble holding it as they use it. There is a double-click for continuous extrusion features. This allows longer projects to be done without tiny fingers getting sore and tired. The speed is also controllable with different settings to ensure more precise designs when needed. The Sketch Pro kit is a great gift for kids. 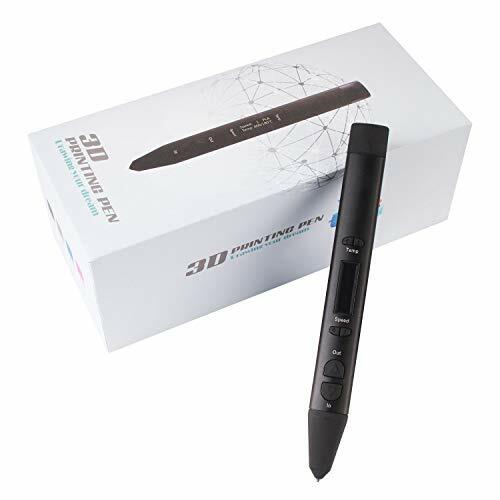 It has the latest technology when it comes to 3D pens and has been designed with easy-to-use functions as well as top-of-the-range safety features. The kit includes the pen, adaptor and cord, filament samples, and an instruction manual. You’ll also get 3 free stencils as well as an entire eBook full of 100 design ideas and stencils. This is all you’ll need to get your creativity working and designs flowing. The Sketch Pro is built to be safe for children, although it does warn that it is not suitable for those younger than 12. Like any 3D pen, there are risks of burning should your child come into contact with the hot tip. The pen does, however, have an auto-shut-off and auto-sleep function which kicks in when the pen is left plugged in unattended. The GOOAnn is an affordable and safe option for children. Checking off almost all the boxes when it comes to find a pen that works well for younger users. The pen is a low-temperature machine, meaning it can only be used with PCL filament, but is safer for young children. PCL filament is non-toxic and odourless. After 2 minutes of being inactive, the pen will switch to sleep mode, this helps extend the life of the device. The pen does not, unfortunately, have adjustable speed or temperature controls. For this reason, it is best suited for young children and beginners who are not interested in making intricate designs, but rather want to learn how to use the pen. From the creators of the first 3D printer, comes a 3D doodle pen designed to be enjoyed by all levels of experience in 3D creating. 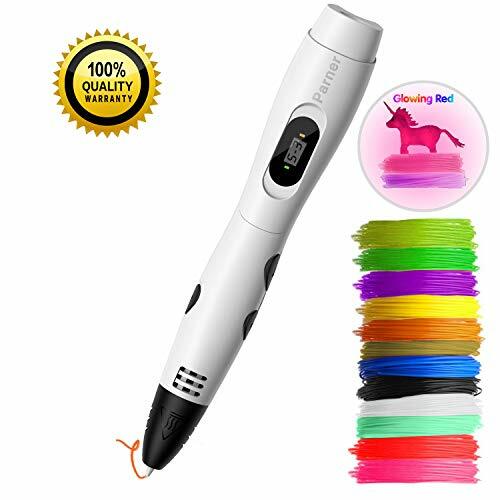 This 3Doodler Create 3D pen box set comes with 50 plastic strands in a selection of multiple colors and materials, a power adapter, a quick start guide for beginners, as well as 3 other tools to use in your 3D doodling. 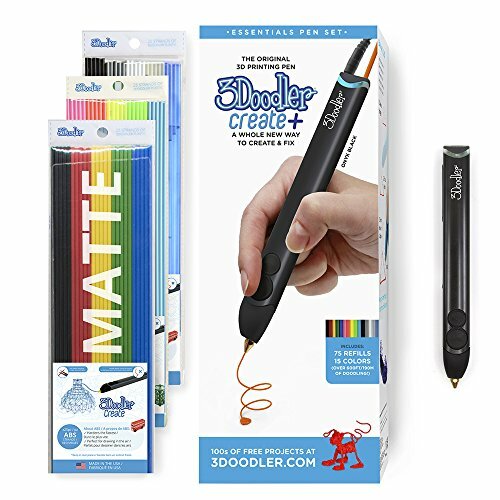 While some pens require you to draw on a flat surface and then connect your pieces together to create a 3D design; 3Doodler lets you draw ‘in the air’, creating stunning 3D models easily. This is one of the more expensive pens but comes in a range of colours and boasts all the latest features. The slim and lightweight design allows you to draw both horizontal and vertical, and the large OLED display give perfect control of speed and temperature. The box comes with the pen, adaptor and cord, as well as three filaments. This 3D pen works well with ABS, PLA, flexible, wooden, bronze, copper filaments, taking away any limits you may find in other pens. The Scribbler V3 has a ceramic nozzle in place of the usual copper nozzles, which makes it safer for children and ensure less risk of burning. The CCTREE 3D pen brings children’s drawings to life. The simple design is great for kids, and it works well as a gift. It is also not an expensive pen, so if the interest wears off, it’s not an excessive investment lost. The pen does not have an OLED display screen to show you the temperature. There is also no temperature control, so the pen will heat up to its required temperature and stay there while you work. You can, however, easily control the speed using the buttons on the pen. The kit does, unfortunately, come with ABS filament, which can cause toxic fumes for kids. It would be a good idea to rather buy additional PLA filament for the kids to use and save the ABS for mom and dad to play with. The Sunveza is designed for everyone, from beginner to professional, making this a gift that will last longer than most. The pen has a LED display, so you can keep an eye on the temperature, and the extruding speed of the filament. It is recommended, however, that you do not use the pen for extended periods of time, to reduce the risk of the pen burning out. There is a 365-day money-back guarantee. In addition to the 3D pen and its power adaptor, you’ll also receive four filaments in different colours, a tiny shovel tool, a pen holder, and a quick start guide. There are also great online resources for designs and templates. 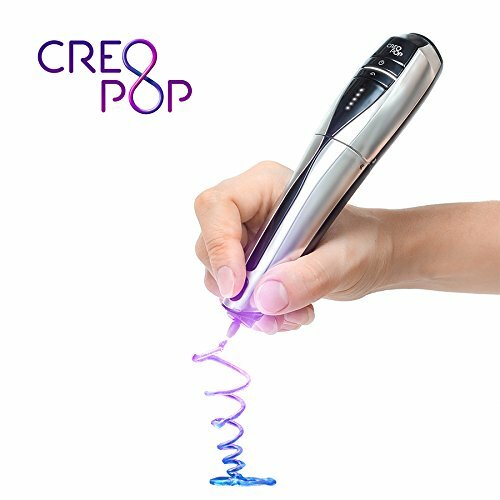 The CreoPop is a cordless 3D pen, allowing for more freedom when designing. Kids won’t have to worry about adaptor cords getting the way of their creations. This pen also doesn’t use heat to melt the plastic, making it safer for kids. CreoPop uses photopolymers that are solidified using built-in LEDs instead of filaments melted with heat. This eliminates the risk of burnt fingers and makes it easier for younger users to design and create with little to no supervision. The pen initially comes with three ink cartridges. The ink is also available in different colours, much like the filament, and can be bought from selected suppliers online. Each cartridge lasts approximately 14 meters. This pen is best for older kids, as the design is not as slim as the other pens suited for younger children. When you purchase the pen, you get five meters of free filament in assorted colours, allowing for many designs to be drawn before you need to fill up again. There is also a lifetime warranty, so you won’t have to worry about it breaking and not being able to replace it. 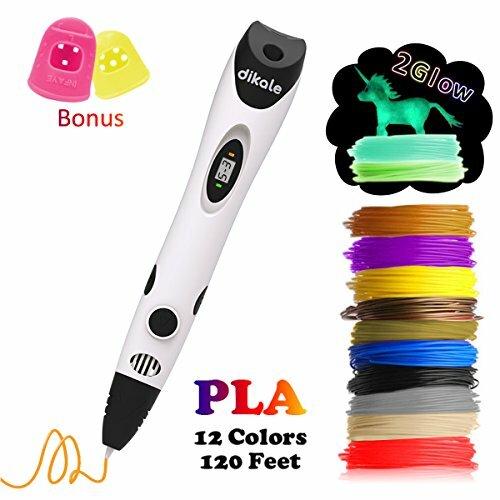 The Dikale 3D Pen is one of the best 3D pens available and is completely suitable for children. The pen is incredibly simple to use, all you need to do is plug it in, let it heat up, and draw away – perfect for children and beginners. 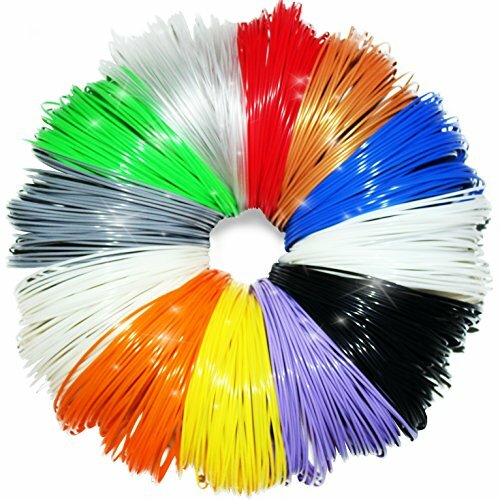 With the pen, you will also get 120 feet of filament, in 12 different colours. There is an eBook available for download that has 250 different stencils to help you get started with your 3D art. The pen is fitted with one button control and adjustable speed and heat. It has a one touch start button, meaning there is no need to hold the button down the entire time you are drawing. The AIO robotics pens is great for classroom activities, as well as at-home use. It supports PLA filament, making it less toxic to use, especially with kids around. The lightweight design also makes for easily handling when it comes to smaller human hands. The temperature of the pen can be controlled in 1-degree increments, which lets you work with a variety of PLA filaments. There are also 5 different speed controls which aid in creating different designs with better precision. This pen is a bit pricier than others but comes with a 1 year warranty (provided ONLY AIO filaments have been used). Although there are many customer reviews stating that the pen gives out after just a short period of time, AIO support is usually readily available to assist you and replace defective products. The Da Vinci pen is an affordable, simple pen, great for beginners and children. It can be used with either ABS or PLA filaments. Da Vinci, however, have created a non-toxic filament that is also eco-friendly. The pen does not have adjustable speed control, making it less ideal for those looking to create more intricate designs. It works well as a beginner’s pen. The price and design are great for kids. There is also no OLED display, which again makes it perfect for beginners, but less ideal for more experienced designers. Smaller children should still only use the pen under adult supervision due to the risk of getting burnt on the nozzle. The KT-Prase is suited especially for kids and beginners. The design is slim, and all buttons are strategically placed for ease of use. The price and durability also make it a worthwhile gift. The speed is adjustable and controlled by easy-to-reach buttons. Temperature can be adjusted in 1-degree increments. The OLED display helps to control temperature and speed. The ceramic nozzle lowers the risk of burning, making it great for younger kids. Children still need be cautious, however, and should not touch the tip while it is hot. The Atmosflare is perfect for parents worrying about kids’ fingers getting burnt. This pen uses UV light to cure the ink, and so the heat felt from the pen is not as hot as usual 3D pens. The ink used for the pen is different to that used by other 3D pens. Due to the pen not using filament, but rather a liquid-type ink that is then cured, you will need to buy the ink from the website of the supplier. 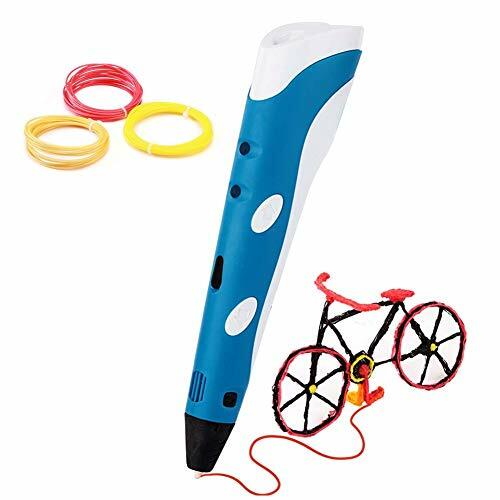 The design of this 3D drawing pen is a bit bulky for a small hand, and so very young kids may have trouble controlling the pen while drawing. 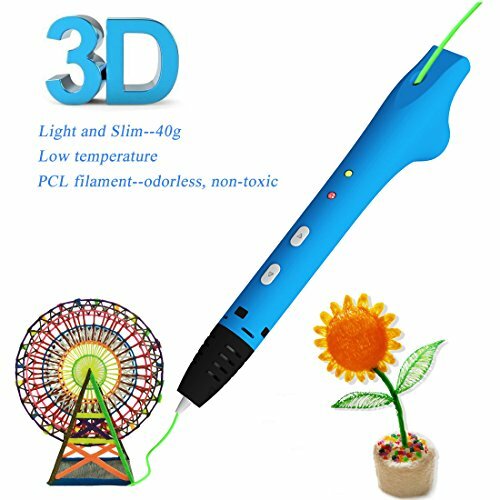 Another fantastic option for kids, the Parner 3D pen has been remodeled and designed to allow children to use it easily. The slimline pen has buttons placed perfectly for smaller hands to reach and has a one-button load for the filament, allowing fingers to rest while loading the pen. There are 3 speed adjustments for the pen, and an LCD screen displaying the speed you are using. The USB charging cable is not very long; however, you are able to charge the pen using a power bank which will give you more mobility. The pen comes with an adaptor, user manual, 12x filament colours as well as a pen holder to allow the pen to cool down and a USB charging cable. 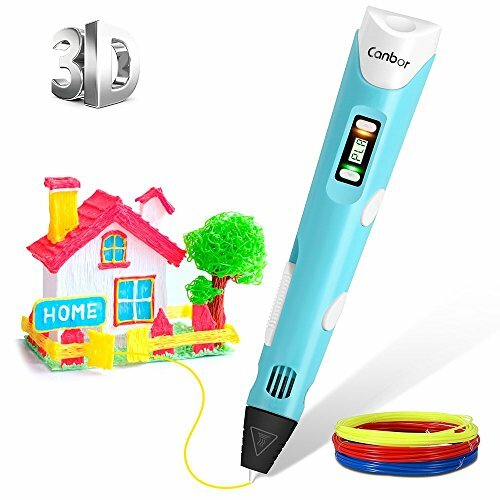 The Canbor is a lightweight 3D pen, great for kids to hold while they draw. There is an adjustable speed button on the pen, as well temperature control. It has an LCD screen to display the filament type that you are using, allowing for control while designing. The pen supports PLA and ABS filament and can create designs with all different colours available. The pen has an advanced intelligent chip, and will shut off after 2 minutes of being inactive. In the box you will receive the pen, its adaptor with cord, user manual, a pen stand, and two colours of filament. The Sunlu 3D pen supports all three types of filament, ABS, PLA and PCL. It also has 8-level speed control, giving you ultimate control over your designs and drawings. The pen is safer than others, with its ceramic nozzle as well as the silicone thumb and index finger protectors that come with it. The ink used in 3D pens is called filament. As we mentioned above, you get many different types of filament. The most common being ABS and PLA. ABS is a more toxic filament and has fumes which are not good for young kids or people with breathing problems. PLA is a non-toxic, environmentally friendly filament with no toxic fumes or harsh odours. The other filament used often is PCL. This filament is for low-temperature pens, it does not need an extremely hot temperature to melt. Below you’ll find some of the best options when looking to buy refills of filament for your 3D pen. 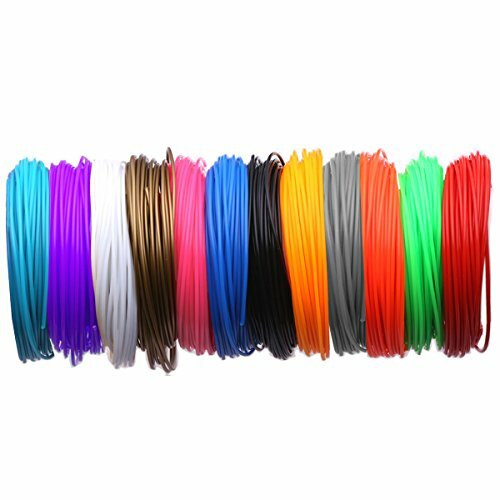 This pack consists of 24 coloured filament, each 3 meters long. There are 15 unique, bright colours and 6 transparent colours. These filaments are the usual 1.75mm and so will work in most 3D pens. The Dikale filament is best suited for the BESTHING, Tecboss and AIO Robotics 3D Pens. This pack includes 16 colours of 2 meters each. You also get a bonus eBook with stencil designs to help with your 3D pen drawings. 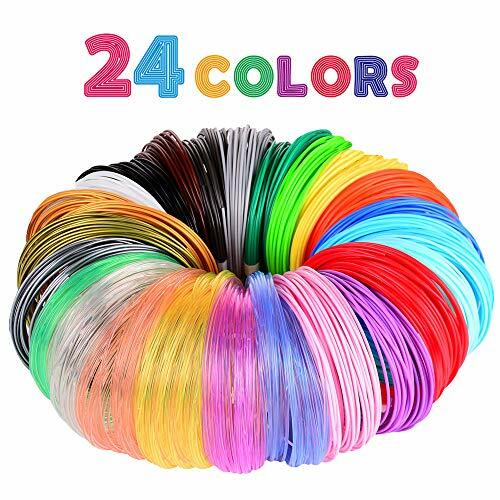 12 different colours of 20ft filament strands, including a bonus glow-in-the-dark filament that the kids will love. This pack is affordable and great for variety when drawing. 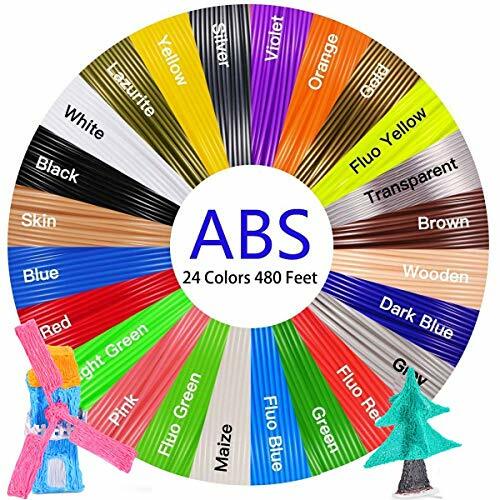 The ultimate bundle of ABS filament, this pack includes 24 different colours. Each colour is 20ft long, and all strands are 1.75mm, perfect for most 3D pens. 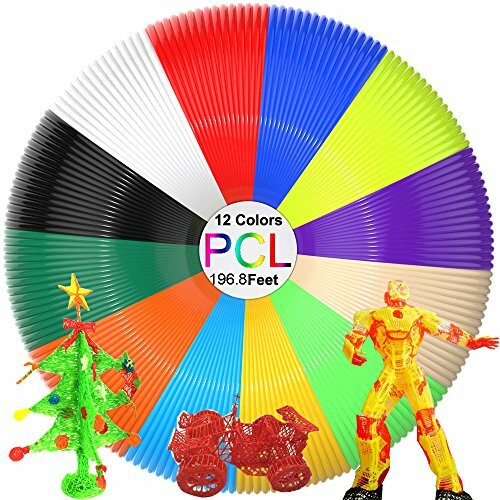 Get 12 colours of PCL filament, at 16.4ft each. Made from renewable plant materials, these filaments are environmentally friendly and durable. This bundle is a 12-colour pack, with bright colours. The 1.75mm PCL filament is suitable for low temperature 3D pens and can be recycled when you are done with it. Before investing in a 3D pen, there are some aspects to take into consideration to ensure the pen you are buying will fit your needs and budget. There are many different pens out there, so choosing the right one can be a bit tricky. 3D pens allow you create 3D versions of your designs and artwork. 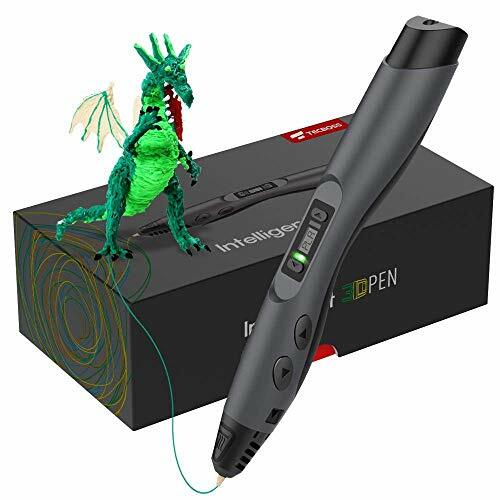 The 3D pen is like a smaller version of a 3D printer, the pens have the ability to bring any design to life, on a smaller scale than a printer. 3D pens utilise plastic ‘ink’ filaments. These filaments are fed into the machine, and then a heating elements melts them, turning the plastic into liquid, which then allows you to draw and create 3D pieces of art on almost any surface. 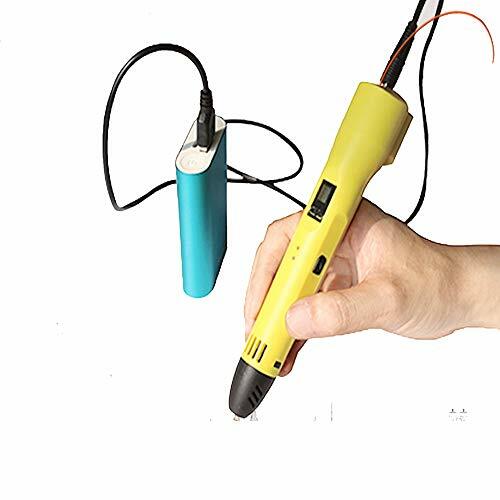 The technology of 3D pens is close to the technology used in hot glue guns, with the exception of the material used within the machine. Control is one of the most important aspects when it comes to using a 3D pen. Control refers to more factors than just how easy the pen is to hold or use. Adjustable speed and flow as well as adjustable temperature regulation gives you added control that can take your art to the next level. The design and ergonomic feel of the pen are also important. Especially if you are buying one of these for a child, you will need to ensure that it isn’t too big for them to hold and control effectively. Some of these pens are rechargeable and don’t need to stay plugged in while being used, others are charged via USB or plug point. There are four different filaments to choose from when it comes to 3D pens. Standard, flexible, composite and specialty. 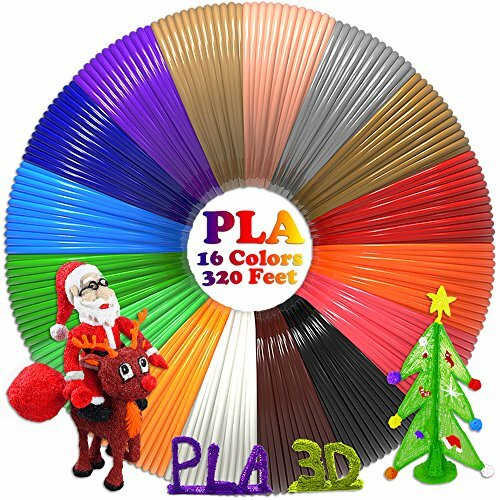 If you are proficient with a 3D pen already, then you will know which filament to choose. If not, the easiest rule of thumb is that if the filament is easy to replace, it is the easiest to use. There is also a difference between ASB filament and PLA filament. PLA filament is a favourite for most, especially when being used by kids. The PLA is mostly non-toxic and doesn’t have a strong odour, while the ASB is mostly toxic and the odour can be a bit much for younger users. There isn’t a huge difference between cool ink and regular 3D pens. Cool ink pens have the advantage of not having any warm or hot parts. This then makes them safer and more suitable for inexperienced 3D pen users, as well as children. Majority of kid’s 3D pens will come with an instruction manual. This is one manual you’ll want to read. Unlike most, it contains valuable and interesting information. The most important thing to remember is to take care of your pen. When you are finished using it, the filament needs to be cleaned out and the pen should be stored away correctly. Leaving filament in the pen usually leads to broken or damaged pens. Aside from the care instructions, you’ll find using your 3D pen quite easy. Depending on whether you have a plug-in, USB charging or battery-operated pen, you will need to make sure it’s plugged in/charged to use it. Then select your filament and feed it into the pen. Once the filament is fed into the machine, wait for it to warm up and you will be ready to create. Your 3D pen can create a wide range of magical items. From simple, small designs to larger, more intricate ones. Some pens will come with stencils, or a book of designs to help on the journey of discovery just what the pen can do for you. If your pen doesn’t come with any helpful material, you can always search the internet, and you will find ideas aplenty. YouTube, Pinterest and even the pen supplier’s own website should have more than enough inspiration to put your pen to its full potential. If you’re wondering what to do with your child’s 3D pen creations, there are many options. Gifts for teachers and neighbours can easily be made with the 3D pen. Keyrings, dolls furniture, figurines and even cars. The only limit is your child’s (or your own) skills and imagination.